Technically Speaking Radio: Myspace joins the Department of Homeland Security? Myspace joins the Department of Homeland Security? When logging in to their Myspace accounts, the last news item that most users woul d expect to see is a note from "Tom" announcing the popular social network's partnership with the U.S. Department of Homeland Security. 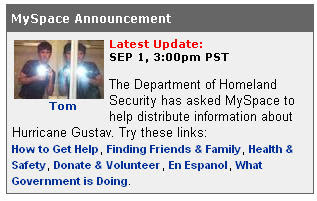 The Department of Homeland Security has asked MySpace to help distribute information about Hurricane Gustav. This information includes links to "How to Get Help", "Finding Friends & Family", "Health & Safety", "Donate & Volunteer", and "What Government is Doing". While this isn't the first time that Myspace has worked with security officials, it is the first time that this union has bordered blatant self-promotion of a government agency. Yes, let's call it what it really is. After Katrina, our government learned that it is important to use every available outlet to let citizens know "What Government is Doing". Although It is encouraging to know that our government is learning to use social media to increase the potential for a successful evacuation and rescue programme, one must consider the pros/cons of this type of union. Will Myspace and other social networks be swayed by Big Brother? This is an obvious concern. Can government agencies truly effectively harness the power of social media without violating citizen privacy? I think it's great that the government is using social networks. I don't care if they see what's in my myspace account. I have nothing to hide.